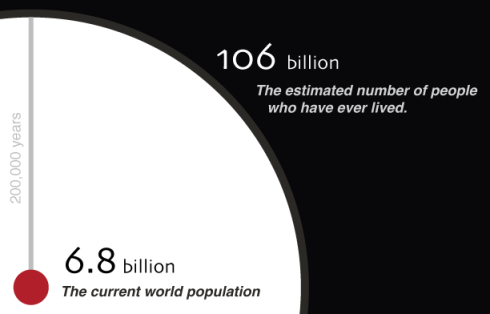 Despite the numbers of the dead being admittedly “highly speculative” in this visualization of the world’s population of the dead, I’m always a sucker for infographics. Click the image excerpt below to see the whole thing, or check out the blog post about it from the creator, Jonathan Gosier at Appfrica. Posted by Meg Holle in Death + Biology and tagged infographics, statistics. Bookmark the permalink.